WINDOW GARD has an impressive list of project references and is proud to place NATO-NAMSA, USACE, NAVFAC, EUROPOL, STATSBYGG, Royal Netherlands Embassies, MoFa Canada, MoFa Denmark, multiple foreign Ministries, airports and multinationals on the list of satisfied and returning clients. WINDOW GARD is a full service provider in infrastructure security upgrades: from custom design engineering to manufacture, supply, installation and project management. Our customer base ranges from governments, military, airports, banks, embassies, offshore industry, petro-chemical to corporate business. 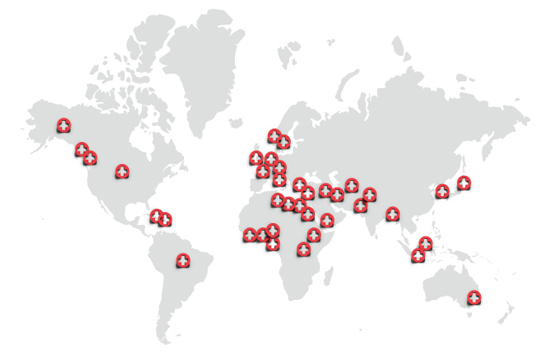 With over 23+ years of experience, WINDOW GARD is renowned worldwide as the blast safety specialist, trusted by many Governments and your reliable partner for all (Antiterrorism) Force Protection projects. • Kabul: Blast & Bullet resistant sliding windows + hatch to HKAIA Base Guard Tower, NATO. • Nigeria: Blast & Bullet resistant windows, NLNG Security Posts, Port Harcourt Head Office. • Canada: >27.000ft² Safety Films + Anchoring Systems to Vancouver International Airport. • Bangladesh: Gate Entry Doors + interior partitions, American Int. School Dhaka. • Jordan: Bullet resistant curtain walls + bullet resistant doors, Kuwait Embassy. • Kabul: FEBR & Blast resistant Doors, Louvers, Hatch for Group Office Building. • Kabul: FEBR & Blast resistant Windows for Group Office Building. • Ethiopia: Blast & Bullet resistant windows, Commercial Bank of Ethiopia, Addis Abeba. • Kabul: Design & Supervision of Overwatch Security Guard Towers for Group Office Building. • West-Africa: Blast mitigation solutions for the Embassy of Canada, Global Affairs. • Brunei: Blast resistant windows + blast resistant double door, BMC Brunei Methanol Com. • North-Africa: Blast mitigation solutions for the Embassy of Canada, Global Affairs. • Greece: Blast resistant operable windows including insect screens, US NAVFAC. • Greece: Blast + bullet resistant doors and counter windows assembly incl. trays, US NAVFAC. • Netherlands: Bullet + Forced Entry resistant doors and windows to Community Center. • Curaçao: Bullet resistant bank teller counters + transaction trays + intercoms, PSB Bank. • Abuja, Nigeria: Blast + forced entry resistant windows to Swiss/DK Embassy. • Lillestrom, Norway: Anti-Shatter Films + Anchoring Systems to Government Building. • Jakarta, Indonesia: Blast resistant double-doors to New Australia Embassy. • Lagos, Nigeria: Cable Catch System + Anti-Shatter Films to MoFa, Denmark. • Curaçao: Bullet resistant windows and doors to Min. of Finance, Netherlands, Phase 2. • St. Maarten: Forced entry resistant windows to Ministry of Interior, Netherlands. • United Nations, Rwanda: Anti-shatter films to UNDP buildings. • Malatya, Kurecik: Blast & Bullet resistant windows and doors to USACE - NATO. • Curaçao: Bullet resistant windows and doors to Min. of Finance, Netherlands, Phase 1. • Balgat, Turkey: Blast resistant windows and doors to USACE facility. • Kabul, Afghanistan: Blast & Bullet resistant Sliding windows to Guard Towers. • Antwerp: Blast Resistant Windows and Blast Resistant Doors to a Petro-Chemical facility. • Oslo, Norway: Anti-Shatter Films + Anchoring Systems to Government Buildings. • Lagos, Nigeria: Anti-Shatter Films to the VIP Airport Lounge. • South Sudan: Blast Resistant Windows & Doors to the Government's President Offices. • Jordan: Bullet & Forced Entry Resistant Windows to the Ministry of Security & Crisis Man.